A Peek Inside Life as a Mama of Three | "In good writing, WORDS BECOME ONE with things." A great friend of mine, Julianne Schneider, recently became a mother for the third time, and since I’m about to join that club I thought it apropos to do a little Q and A to focus my binoculars on that field a yonder that I’m traveling toward. Julie, alongside her husband Jeff, is the proud mama of Brayden, 4, Luke, 2, and Samuel, two months. She recently moved back to her home state of Wisconsin after living in Seattle for seven glorious years, and is experiencing the unique culture shock of one transplanted home again. She’s a board-certified teacher by trade but is spending this year as a stay-at-home-mom. This exchange took place when Sam was only four weeks old. Thank you, Jules, for sharing with us! WBO: First things first: are you keeping your head above water? Julie: We are doing as well as could be expected. We keep waiting for the floor to fall out, but that hasn’t happened yet. Perhaps, once we all get sick, then it will collapse. We are tired, but we are managing. I am very thankful that Brayden is at 4k in the morning, so I don’t feel guilty not playing with him and giving him the attention he wants (but doesn’t always need). WBO: What’s the hardest part about having three? Julie: The hardest thing about having all three is their needs are all so different! 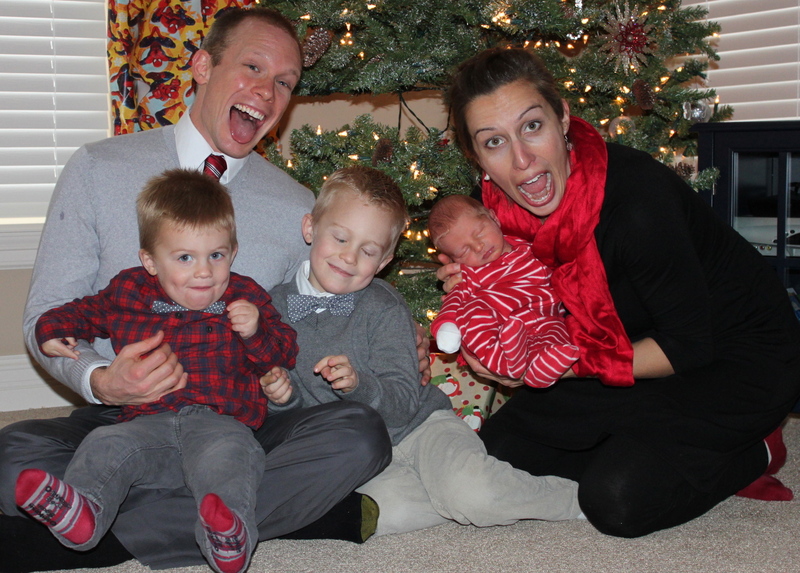 Brayden wants to play with Legos, Luke wants to destroy Lego creations (or eat them), and Samuel wants to be held. Harmony is impossible at these moments. For this reason, I am very thankful for PBSkids which keeps Luke entertained (and away from Brayden’s intricate Lego creations) while I am feeding Samuel, showering, or heaven forbid, feeding myself. Yes, TV is a great babysitter, and thankfully safe and teaches him a few things. I used to feel guilty about this with Brayden; now we are more in survival mode, so what the heck…I watched Sesame Street and I still went to college. WBO: Is there anything that surprised you because it wasn’t as hard as you expected? Julie: I think the transition wasn’t hard because we are already in kid mode. We don’t go out to dinner or fancy ski trips to the Alps. We don’t feel like we are missing anything anymore, which may be what makes having kids hard to begin with. The kids provide our daily adventure. Going from one to two made things harder, and pulled us both into the parenting, with less breaks. Now we are both in, and when Jeff is home, he knows what to do — no directions. I feel like we are a well-oiled machine. We just keep moving. No down time until all the kids are sleeping and we have dark chocolate and Netflix as a reward. WBO: What have people’s reactions been to you having three boys? Julie: Their reaction to three boys is very predictably, “Oh, you will have you hands full!” or “Will you try for a girl?” The cool thing about having three boys I learned is that once you have a third boy you enter this secret society of other moms with 3+ boys. During my delivery (we didn’t know what we were having), the OB who delivered Samuel and my actual OB were hoping I would have a third boy, as they both do. 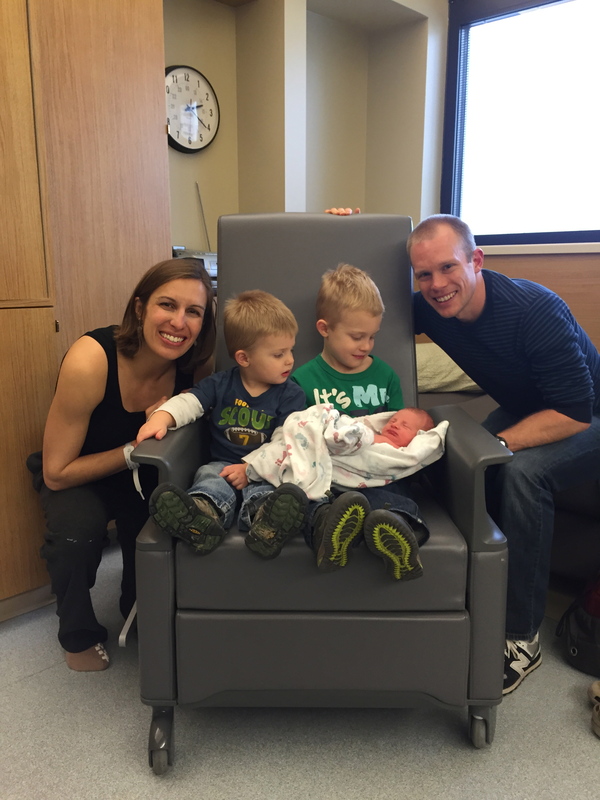 After Samuel was born, they stuck around to share their joys of having three boys and welcomed me to the “club.” We seemed to share a common bond of living in the shear craziness of boyhood. We commiserated over not having calm tea parties or arts and craft sessions. Rather, they shared how exciting and loud their homes were. My personal reaction to having three boys is of gratitude. As I reflect on the adventures I have already had with these guys, I recognize that God has equipped me to be a mother of boys. I truly believe it was all part of His plan. I don’t get super excited about the wrestling matches or bug catching. But I love building Legos, playing chase, and I already have the basketball hoop picked out to play basketball with them. I am also thrilled that I will probably never ever have to kill a spider again. Brayden has already taken over that role when Jeff is not around. If we never have a daughter, a curiosity may exist for what she would have been like, but never a disappointment. WBO: Is it hard coordinating different schedules? Like feeding Sam so often but the others just three meals (plus snacks)? Or managing different nap schedules? Julie: Brayden and Luke essentially have the same schedule. To bed at 7 and up between 6-6:30. Brayden doesn’t nap anymore, but from 12:30-3 is quiet time at our house. Brayden either reads books, plays Legos, watches a show, plays iPad games, or him and I do “learning time.” Feeding them all isn’t really that big of an issue, I mostly just get tired of doing dishes. I am thankful that Samuel doesn’t require any dishes. WBO: What adjustments did you have to make in terms of gear? A new car? A different stroller? Sharing rooms? Julie: We have a big car (Honda Pilot), but had to put Brayden in the third row to avoid all three in the same row. There would be way too much poking going on, and separation is good. Brayden and Luke both have their own rooms, and the baby is living in my closet. Our master is on the first floor, so I don’t think Samuel will be moving upstairs until he is mostly sleeping through the night. WBO: Are there other kids in your new neighborhood that your kids can get together with? Julie: We are thankful for new neighbors who organize playdates, and this entertains the older boys, especially when it is wicked cold out! The pent up energy needs to get released somewhere, and I am only up for so many games of hide-n-go-seek or chase before I need a break. WBO: Tell us what it’s been like moving back to Wisconsin as a family, since you left as an engaged couple. Julie: Even though we grew up in the area, we feel like transplants, since it has been almost 15 years since we lived in this area. Sometimes I tell a small lie when I meet people, and just tell them we are from Seattle, so they don’t assume I know more about the area than I do. We are experiencing some culture shock, good and bad. People are super friendly, but sometimes close-minded, or maybe it’s just more that they don’t know what they don’t know since they haven’t left the ten mile radius where they grew up. WBO: As a parent, what are some of the more obvious differences between Seattle and Wisconsin? Julie: I find the playdates to always be interesting…I was surprised at my first playdate and the type of foods that were served. Really, Cheetos? For 4-year-olds. The moms in Seattle would have a heart attack. I am not sure if I appreciate less pressure now that I am not expected to make kale-carrot smoothies, homemade granola, etc., or more pressure to do more to counteract the influx of junk food. Brayden is currently obsessed with Cheetos since kids on this bus bring them for snack everyday. I am standing my ground on this one though — no Cheetos. To show my resolve, I got him sushi at Trader Joe’s yesterday and reminded him that this was his favorite food in Washington, and not Cheetos. We talked about how the carrots in the California Roll were natural orange, and Cheetos were fake orange, like eating a Crayon. WBO: Does babyhood seem to go faster with each child? Julie: Yes! But I think isn’t that true of the time of life in general? I feel like each year keeps going by faster and faster. I really can’t believe I am 32 or that I will have a 5 year old this spring. 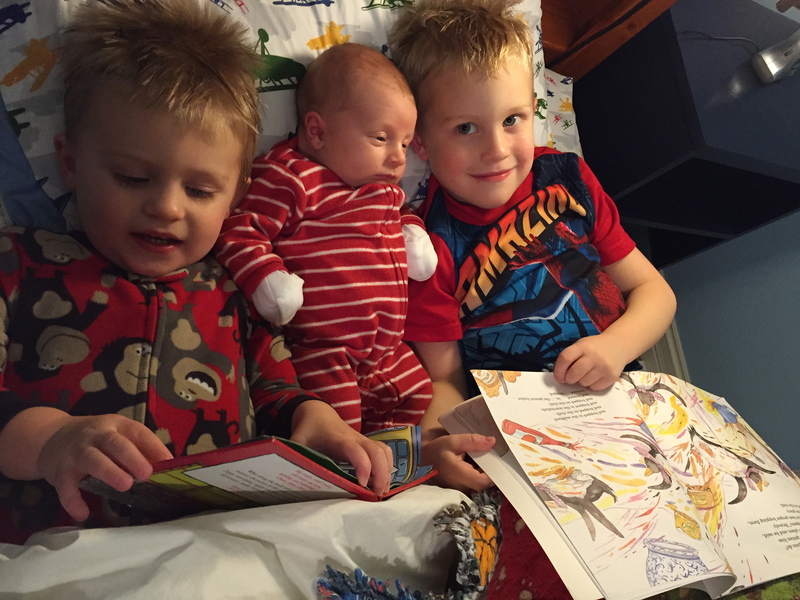 The newborn phase with all three boys was a blur, and it is so short, just mere weeks before they start smiling, maintaining eye contact, filling out, and holding up their heads. I am not sure it feels faster. I think the biggest difference is you don’t hyperanalyze every change, as you know the next day it will be something different. The old adage of “the days are long, but the years are short” becomes more and more true. WBO: How do you manage to keep your spirits up when it’s just.so.much.work? Julie: Despite the loss of down time, there is so much laughing (and crying and screaming and whining) in our house. The noise is incessant, but amazing. Our home feels alive, and there is always something going on. It’s exciting to see them grow, and seeing how quickly they go from a baby to a boy, so we try not to wish this time away. Seeing how they are starting to develop relationships between each other is so exciting. Luke adores Brayden, and can’t wait for him to get home. Both big boys adore Sam, and Brayden is the master at holding him and getting him to stop crying. So in short: it’s tiring, but awesome. The highs definitely outweigh the lows. Thank you so much for sharing with us, Julie! You are one amazing mama (and I will be calling you once I cross this threshold). Way to go, Julie! You sound so organized and you have everything in your control. What a woman! !